Wellbeing can be defined as health, happiness and success. But of course, these terms are very individual and personal in their meaning and can mean very different things to different people. My definition of wellbeing comes from a very holistic perspective where one is in a state of balance and calm, can cope with the normal highs and lows of life, can work productively, have solid relationships, and in which one really realises their true potential. Despite the fact that in the UK, and many parts of the western world, we have become financially richer and more abundant, levels of happiness and wellbeing have not kept up. Stress levels are on the increase, people suffer from overwhelm, low energy, low mood and self-doubt. This is where a wellbeing coach can add huge value, by helping people to rediscover their true self, their true nature, who they really are, and to help to motivate, energise, and inspire people to discover their innate wisdom, power and happiness. As a wellbeing coach, I am there to guide you, to point you in a new direction and to help bring about a clearer understanding of your issues or concerns, and to help you move forward towards your aspirations and goals that you wish to achieve. By listening, questioning, reflecting, encouraging, challenging and supporting, I will guide you to solve your problems and the challenges that life may present you with. My programmes will often (but not always) involve a combination of nutrition education, nutritional therapy and coaching, depending on the client's needs and desires. My support is available for £125 to £1200 dependent on length of programmes and level of intensity and support. I tailor programmes to suit individual clients' needs, there is no 'one size fits all. If you are interested in finding out how I can help you to achieve your goals, book a complimentary discovery call today! We all have habits, don't we? I've had many. I used to use sweets as my emotional crutch. Jelly sweets to be precise and I could polish off a large bag before anyone else had opened theirs. They didn't even touch the sides, I didn't taste them, I would just plough my way through until they'd gone, and not just one bag. When did I do it? When I was feeling stressed or unhappy. And for that short moment, I felt better. Another of my habits used to be tidying... obsessively tidying - or rather moving things into piles and then straightening the piles. Straightening anything that wasn't straight and in line. Habits are those things that we feel driven to do, that we feel somewhat or completely out of control of, but that we know are not necessarily good or healthy for us, but we continue to do anyway. I work with clients to ​show them a new understanding of their human experience. This new understanding can have a profound impact, not just on issues around relationships with food but across their life, with the power to improve all areas of their life. My unique approach combines coaching with nutritional therapy and healthy eating programmes, where appropriate, which is why my programmes work so well for those with weight concerns combined with emotional eating. Would you like to find out more about how I can help you? 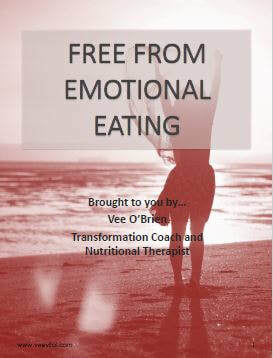 I offer a complimentary 30 minute Discovery Call where we can discuss what is happening for you at this time, and how this insight might help you to break free from emotional eating... for good! “100% of our feeling is arising from THOUGHT in the moment..."
And then something changed for me...I stumbled upon something that completely changed the way I see the world, the way I think, and thus the way I feel, and my stress levels started to reduce naturally, without any ‘effort’ or ‘trying’ or ‘managing’ from me. The changes in my health and feelings of wellbeing and happiness were immense. Nothing had changed on the outside, but everything had changed. It all happens with a conversation. That’s it, just talking? Well yes and no... There are no strategies, not really any coaching tools and sheets (except when we agree they might be helpful). There is no homework for clients, there’s actually nothing that they need to do other than naturally and insight-fully deepen their understanding of these principles. As clients come to see the truth about themselves, that they are as whole, confident, peaceful, happy and well as they always have been, and as they were when they arrived on planet earth… life starts to change for them. Habits, urges, stress, worries, anger, resentment, fears all melt away. Of course, nutrition, sleep, exercise and an overall healthy lifestyle is all part of it, and I also use nutrition education or therapy with clients, where appropriate too. If you are ready to see life in a new way, to see your life and yourself in a new way, to say goodbye to stress... and if you are ready to make some big and profound changes to your life, I’d love to chat to you. It is easy to lose weight but hard part is to keep it off! I am 58 years old and during the last 20 years have struggled with my diet and my dress sizes yoyo. I found it just easier to buy bigger clothes and easy to cook ready meals or take-aways - for a while that was ok. My cholesterol sky-rocketed, my tummy bloated and since the menopause kicked in everything became chaotic: the mood swings, night sweats, metabolic rate crashed and then my body decided to move south! I felt invisible and completely out of control of my emotions and my eating – food seemed to control me. I would eat the fridge when under any kind of stress. I knew I was comfort eating and let my thoughts dictate my eating and decided what I need was to change my lifestyle and my thinking. I wanted to learn more about nutrition too. I didn’t really know where to go for this support and advice. For a while I had a personal trainer and he advised me that being fit is 80% food and 20% fitness. He advised me to consider getting my eating under control and introduced me to Vee. Vee helps me understand how to control my diet – her expertise as a life change coach and nutritionist really works for me. It hasn’t been easy an easy journey and looking at your emotions and where they come from is at times uncomfortable, you need that right person - someone you can trust and feel safe with to share those issues – however big or small they are. Vee showed me how to change my thoughts or just accept them rather than turn to the fridge or chocolate! There are the odd glitches but she has helped me to understand where my thoughts come from and to change those to more positive thoughts and outcomes. She is encouraging me to get to my target weight and I have lost some weight and can’t wait to get to my spin class now – my knees don’t touch my tummy anymore! I enjoy food and I am changing my habits too, I make more nutritious and healthy meals. I am learning to put myself first and be less of a people pleaser. I cope with life’s pitfalls more easily and I know for sure that if I didn’t have Vee (my guiding star) in my life I would be at least a stone heavier and my wardrobe would be full of more extra-large sized clothes. I have gained so much more than losing weight – my confidence and inner strength and most importantly I feel lighter in the mind, soul and body. I wish I knew her 20 years ago!